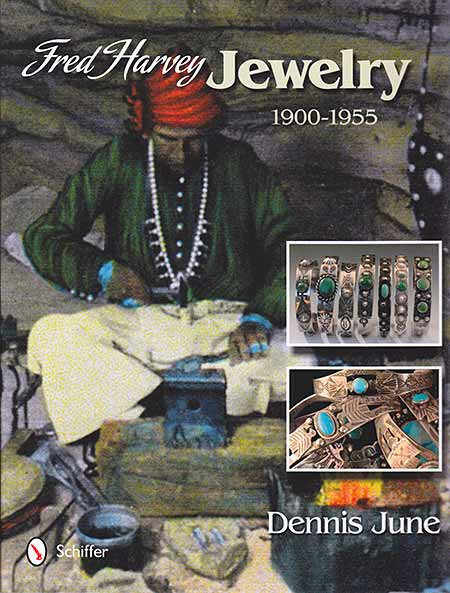 Fred Harvey Jewelry 1900- 1955 by Dennis June "The success of American Indian silversmiths follows a pathway blazed by the silver jewelry makers who came before- those who worked raw silver, channeled it, and made it profitable. The Fred Harvey Company organized production and ran retail shops for tourists along Santa Fe Railway routes, helping to build popular jewelry styles upon which today's Southerwestern jewelry traditions survive. The book focuses on vintage souvenir bracelets from private collections that were studied and photographed, and the parallels with handmade originals. 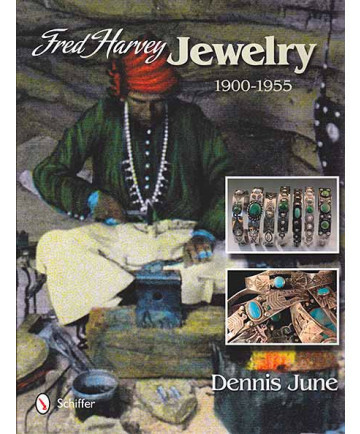 Images of early Southwest jewelry are supplemented by Harvey Company Photostint postcards, to provide a fresh vantage that clarifies the complex styles of Indian jewelry and their champion, the Fred Harvey Company." Jacket cover Hardcover, 176 pages.